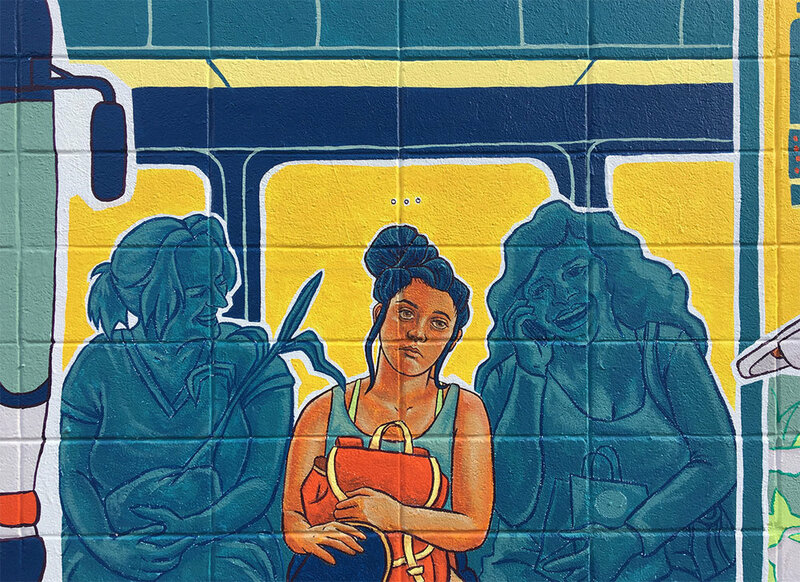 Photo of my mural taken by LeaLea Market. Official photos coming soon. Not wanting to paint a giant landscape, I realized if I broke up the wall into smaller sections, I could create a series of sequential images to form a narrative (think like a graphic novel or comic strip). It became a pretty straightforward story about a young girl’s bus commute from point A to point B. Big thank you to my skater girl Teisa and bus riders, Shar (Punky Aloha!) and my mom, paint wranglers Jill and Diego who worked over time to help me get it done, and Pow Wow directors Jasper, Kamea and Gress, and to all the Pow Wow sponsors who helped make it possible: Hawaiian Airlines, Monster Energy, Montana Cans, 47, Alohilani Resort, Hawaii Tourism Authority, Heineken, City Mill, and Thinkspace. See the gallery below for a few close ups and process shots throughout the week. Official photos coming soon. I was invited to create a Hayao Miyazaki inspired illustration for the Spoke-Art x Pow Wow Hawaii pop up show at Ala Moana, #MyNeighborHayao. I chose to represent the movie Ponyo. You can purchase the original here, or email events@spoke-art.com for more information. "Only the Important Things" 12x16" acrylic, colored pencil on wood panel. Here’s my last piece of 2018! This painting is a pre/sequel of sorts to the mural I did for Pow! Wow! Hawaii last February (see it here). 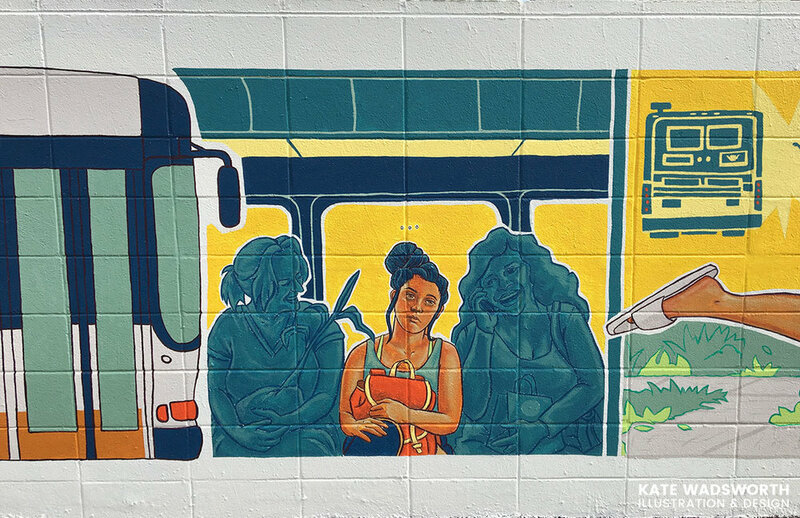 I wasn't completely satisfied with my mural because it was missing an integral part of the equation: the Roy half of my “River Bandit” neighbors, Kala and Roy. Between Pow! Wow!, a couple of group shows, and my 28 Summers solo show, I created a new body of work and became more comfortable in my approach to illustration this year… All the while, the cogs were turning in the back of my head trying to figure out how to utilize the reference photos I had taken of the River Bandits, and recreate a (smaller) illustration that captured the antics I imagine these boys get up to, speeding up and down the canal in our backyard. 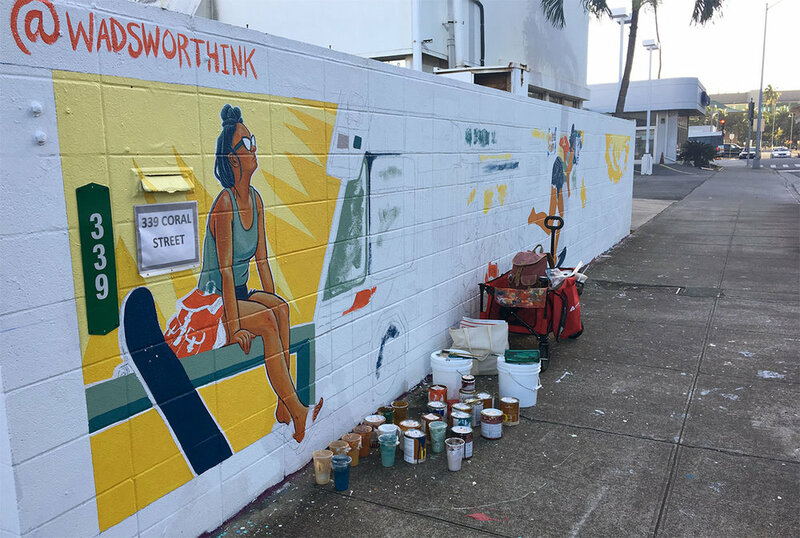 With the same inspiration I had at the beginning of the year, the end of 2018 came full circle when I painted “Only The Important Things,” a pseudo re-do of my mural. Its nice to see the progress I’ve made in a year. Looking forward to seeing what happens in 2019! 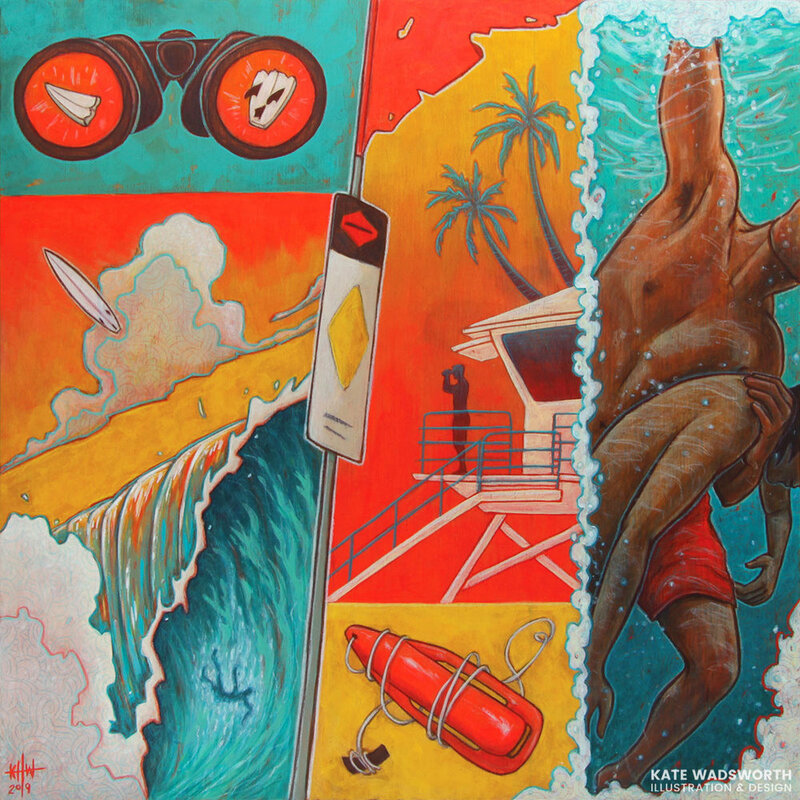 A huge thank you to all of those who attended the opening reception of my solo show "28 Summers" at Kailua Gallery! Special thank you to Ruth Sorensen who made the entire show possible, and special guest Kim of Kyote Designs for displaying her beautiful jewelry. "28 Summers" is a series of illustrations inspired by a recent move back to my hometown, after spending many years across the country. 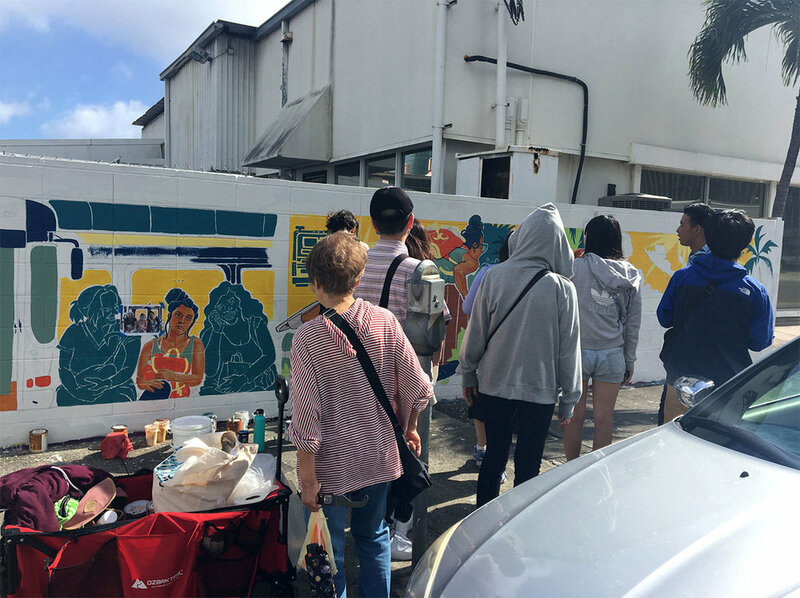 The pieces vary a bit in subject matter, but are tied together by nostalgic interpretations of my childhood/adolescence growing up in Hawaii. 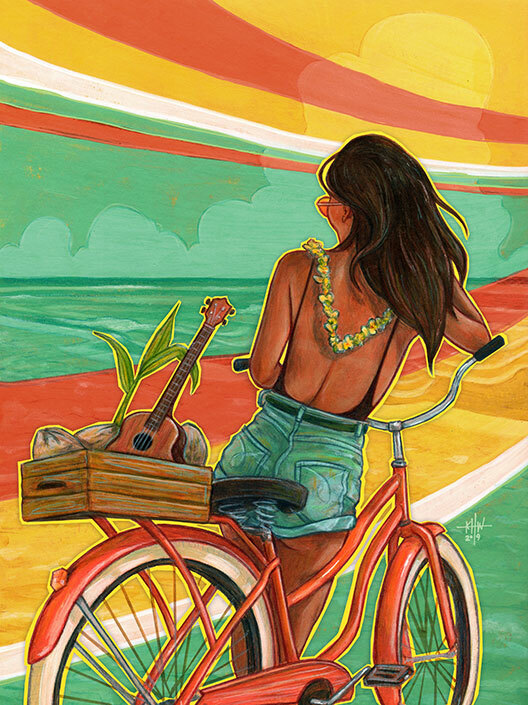 With warm saturated colors, I wanted to depict joyful reflections of endless summer days covered in sun, sweat and outside antics. I have an assortment of hand embellished, very limited edition prints for sale exclusively at Kailua Gallery. Contact Ruth for availability and purchase info. I also painted a 20x10ft temporary mural on one side of the gallery. Check it out by September 17th, before it gets painted over!